GPR is a small enthusiastic company based in Surrey and providing turning, milling and machining services in Slough, London. Turning, milling and machining is an essential process in manufacturing industry. This is especially true when you require the ability to mass produce components or products with an extreme control on quality. GPR prides itself in producing high quality machined parts to client’s drawings and specifications at competitive prices and schedules to meet the tight budgetary demands and time constraints of its customers. 90% of GPR’s accumulating client base is from existing satisfied customer recommendations. We are highly experienced in providing CNC turning, milling and machining services in London. We are a team of exceedingly knowledgeable and skilled engineers who work hard to provide an professional service and excellent products. We produce unique prototype products or full batches of components that are identical in specifications. Please contact us today to find out more about turning, milling and machinery in Slough, London. 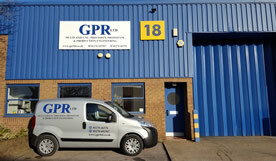 GPR Ltd, Unit 18, St. George’s Ind. Est. G.P.R. LIMITED. Registered office: UNIT 18 St George's Industrial Estate, Wilton Road, Camberley, Surrey GU15 2QW. Company No. 01809243. Registered in England and Wales.